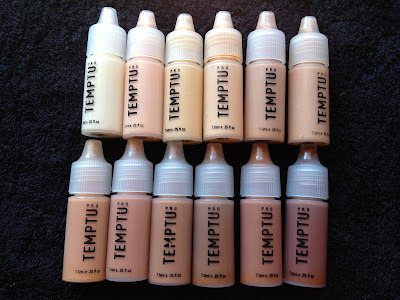 Swatches of my silicon based Temptu foundations. I must admit I don't use these through the airbrush gun as I have another favourite brand, however I do like to use these hand applied which gives a very nice, light finish to people who don't need a lot of coverage. Hy! Can you tell me please what is your shade normally? If you use MAC foundation, what is your shade? Hi Lora, I'm afraid I don't use Mac foundation so don't know what colour I am. Hi! I want to use a water-based foundation, you mentioned you prefered another brand and not Temptu. Could you share what brand of airbrush foundation? Hi Lola, for airbrush makeup I use ElemenTwo canvas blend foundation which is silicon based but ElemenTwo also have a water based range called Skin Harmony.